Is This the New LOST ARG? 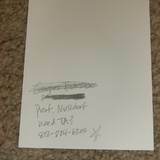 It’s pretty obvious this is the beginning of a new ARG. 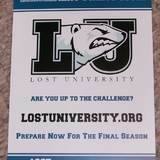 The link provided on the front of the card, www.lostuniversity.org, takes us to the ABC website for Lost University with what appears to be lots of interactive fun. I’m thrilled! This looks a lot more fun than last year’s ARG and we are overdue for something to keep us occupied until January. A TV producer by the name of Anthony Barrett has filed a lawsuit against ABC and Touchstone Television, alleging they stole the concept of LOST from him. Barrett, who was previously a producer on Baretta and Babes in Toyland claims he wrote a 130 page script and submitted it to ABC in 1977 (hmmm…did he travel through time with LaFleur [Sawyer] and the gang? ), and again several years later. In papers submitted to the court, Barrett lists the similarities between the two programs. I’m always wary of things like this when they occur. Although Barrett states he filed the lawsuit in 2004 and it was thrown out for a “techniciality”, why are we just now hearing about it? Why wasn’t he raising hell when word of LOST went out in 2003? Considering the billions of dollars the shows made, I find his claim about as feasible as polar bears on a tropical island. Meanwhile, word on the streets is that Barrett is being sued by Sherwood Schwartz for ripping off Gilligan’s Island. The latest edition of Getting Lost from TV Guide. All UnLocke or Man in Black…Intrugiing…I love the Egyptian theory. It ties in with my earlier island theories! As the “Biggest Shocker” of the year HERE!